Ultraviolet light has a wavelength between 10 nanometers and 400 nanometers, this puts it below violet and indigo on our good old rainbow and outside of the visible light spectrum our eyes can detect. Good times happen when ultraviolet light hits certain materials – some cheerful objects will fluoresce and emit visible light when hit with these otherwise invisible rays. Paper or fabric brighteners, glow sticks, many coloured plastics, some organic fluids – these will light up under the blacklights you see at nightclubs or the kinds of parties to which I am seldom invited. 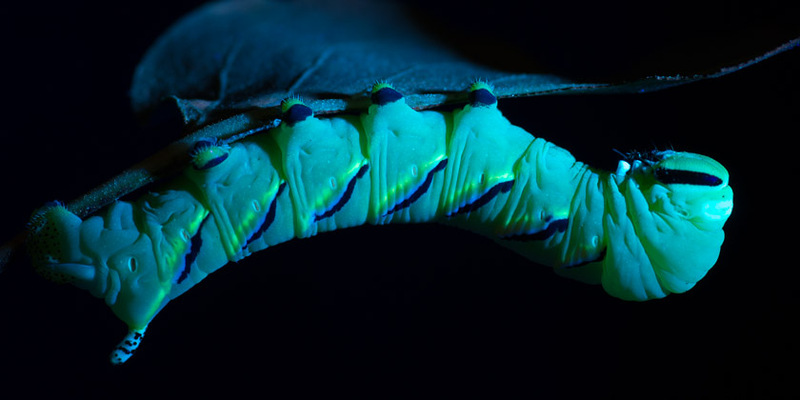 Caterpillars don’t get invited to these sorts of events either, which is a shame as some of them could teach us a thing or two about maintaining style under a UV light. A morning of chasing butterflies and other insects through a field. Workshop leader, James Kamstra, explaining some butterfly facts. On Sunday, July 16, 2017 Ontario Nature and James Kamstra held a Butterfly ID Workshop at the Kinghurst Nature Reserve. It started off rainy with some fear of lightning so the butterflies were initially scarce. 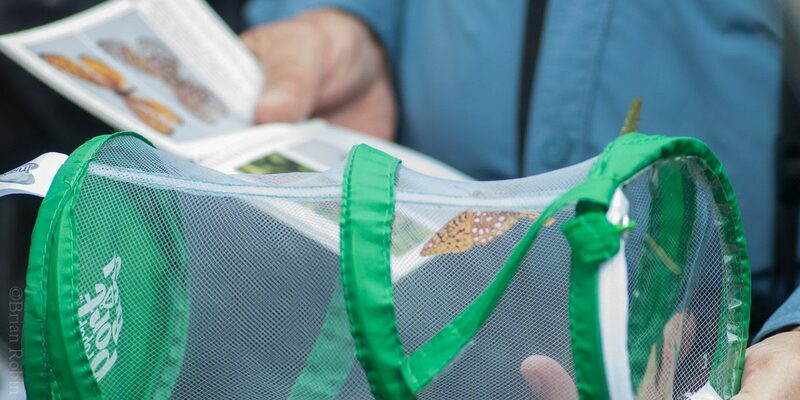 As the rain passed and the sun popped out, the Lepidoptera activated, and the 25+ participants had a nice introduction to butterflies and other incidental insects. It was the first time several of the attendees had been to the Kinghurst property, and I expect it won’t be their last. 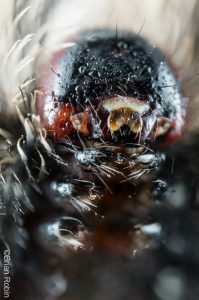 Carry on to some of our insect finds. 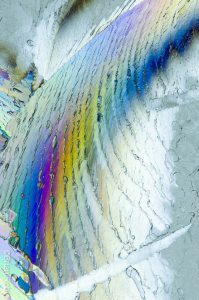 The freezing and melting of water, as seen with birefringnce and time-lapse photography. To date, I’ve been content to set water out overnight and examine nature’s icy creations in the morning. A late February warm spell made this proceedure impossible, with unseasonably warm overnight temperatures that turned my liquid water into puddles of slightly colder water. Nice, I guess, but not what I was after for a photographic subject. Early March featured a nice cold snap and I returned to laying out sheets glass covered in water in the evening. After almost 2 weeks of an early onset spring induced ice-photography hiatus, impatience had set in and I couldn’t wait until morning. Bedtime on hold, I started neurotically checking the state of my ice-to-be every few minutes to see what was happening. On to the freeze-watching, which includes time-lapse videos. An idyllic walk through cycling colours. 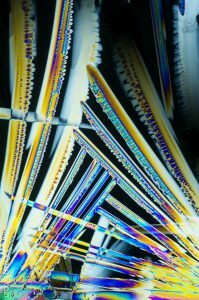 A thin film of soap in a wire loop has the same swirly colours you find in birefringent ice, but a little more organized. 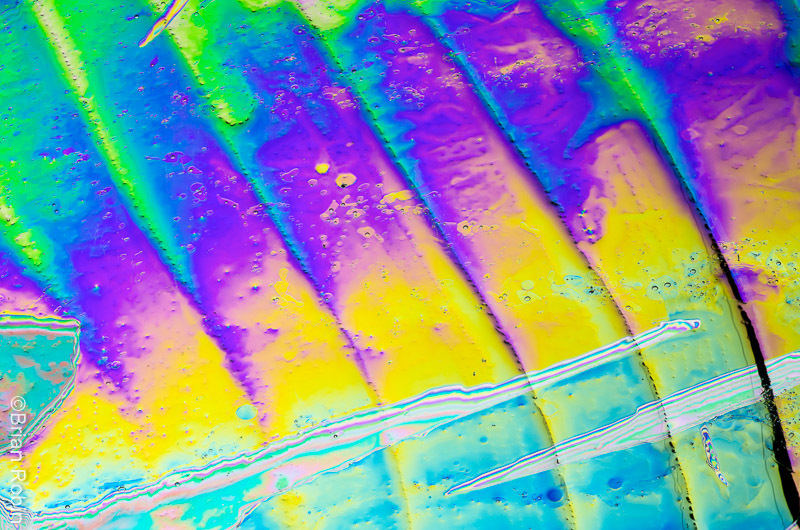 If the crazy colour palette in the header image looks familiar, you’ve either been looking at my past posts dealing with the birefringence of ice, or you remember playing with soap bubbles as a kid (of any age). Or maybe you played with oil slicks, they’re trippy too. 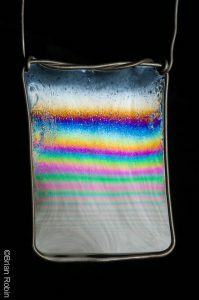 There’s a fancy physics reason for this, with soap film, oil slicks, and these ice photos, the colours are the result of light waves ‘destructively or constructively interfering’ in fun ways to get a spectrum ranging from black, to white, to a tobacco colour, through a classy mauve, over a deep sky blue then a warm yellow, past a pretty pink, then a lighter tasteful blue, finally more or less alternating between neon greens and pinks, becoming duller and duller with each cycle. Or how to manipulate ice thickness for coloursplosions…. Ice from a river’s edge, Feb 2016. Pretty enough, but what other shapes can we get? Can I get them on my front porch? After my initial foray into the Birefringence of River Ice early in 2016, it was fairly clear that the thicker parts of the ice end up…clear, and it’s the thinner parts that liven up between crossed polarizers. 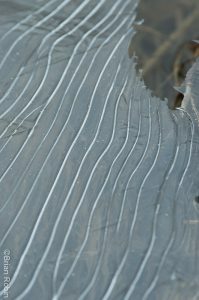 Nature does a fine job of making thin ice on river edges or the tops of puddles with endless interesting shapes to explore, but why not ‘make’ some thin ice and see what happens? As a bonus, being able to make some thin ice at home means you can photograph it in your pajamas and no trudging off in the cold to a river or a puddle in search of a suitable piece of frozen water. Laziness for the win! It’s snow pretty – especially when it’s on the other side of the field, out of shoveling range. A fresh layer of snow overnight creates a magical winter wonderland to wake up to. It creates a fresh powder to record frisky animal tracks. 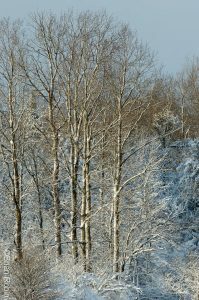 It creates a crisp and refreshing chill in the air. Snowfall means shoveling the walks, steps, and sometimes the roof. It means blowing the laneway. It means cleaning off the car before you drive down said laneway in search of picturesque snow covered scenes. Or how I combat cold winter colour cravings…. Standard issue ice found on the edge of a slow moving stream. Captivating greyscale patterns with a colourful secret! I don’t mind our cold Ontario winters, in fact, I try pretty hard not to complain about freezing my buns off. This gives me the right to complain bitterly about the absurd heat and humidity we’ve had the past few summers – I can always add more layers of clothing to fight off -30°C, but I can only remove so many layers to combat +30°C before I start getting arrested. What does get me down in the winter months is our overall lack of sunlight, and the dreary, overcast, chromatically-challenged days are more trying than a frozen beard.